Six in Studio: Call for Artists! 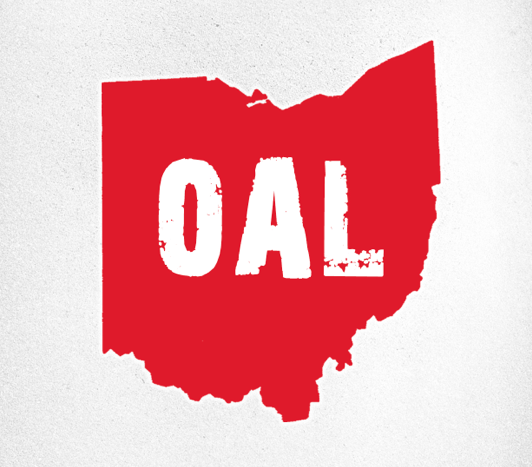 Cleveland West Art League is excited to announce our Six in Studio call for artists! We are delighted that this year’s exhibition will be curated by artist Arabella Proffer. The “opening” will be Friday, March 20th and the closing will be on Friday, April 17th during West 78th Street Studios’ monthly Third Friday. The six selected artists will spend the month between those dates working on their installations, and the completed work will be shown at the closing reception. 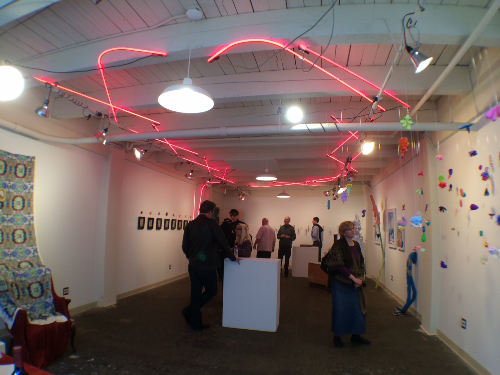 2-D, 3-D, and installation work is welcome, as are collaborations between the selected artists. Please submit your artist statement along with 3 jpeg examples of your work for consideration by Wednesday, March 6th, 2015 to cwartleague@gmail.com. This has been a wildly popular project in the past and CWAL looks forward to an exhilarating showing in 2015! *Please note that you have to be a member of CWAL to have your work viewed by Arabella. Membership can be bought up to and at the time of submission. To become a member or to renew your membership please visit http://www.clevelandwestartleague.com. Power of the Press: Call for Artists! 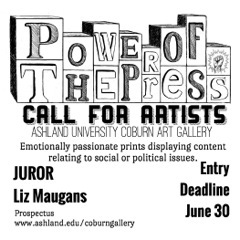 Ashland University’s Coburn Gallery seeks socially and politically engaging prints for the exhibition Power of the Press. Cash awards of over $500 for Best in Show and Juror’s Honorable Mention will be awarded. The theme of the exhibition Power of the Press focuses on emotionally passionate prints displaying content relating to social or political issues. Selected prints will build on the university’s historical collection of satirical and expressionist works by artists Honoré Daumier, Francisco Goya, and Käthe Kollwitz. Liz Maugans, one of Zygote Press’ co-founders and managing directors, will serve as the juror for the exhibition. She is a native of Ohio who received her Masters of Fine Arts in Printmaking from Cranbrook Academy of Art in Bloomfield Hills, Michigan. Maugans teaches drawing and printmaking at the Cleveland Institute of Art, and has taught at various other institutions in the Cleveland area. She has exhibited nationally and her work is held in several collections. Entries must be original works created through traditional or experimental printmaking. We encourage submission of works that address social and political issues that are currently impacting our society. Artists working in the United States, age 18 and older are eligible to submit up to 2 artworks with a $20 entry fee. All works must have been created within the last 4 years. Artists are responsible for shipping costs to and from the gallery. The deadline is June 30, 2015. Please address any questions to cpetry@ashland.edu. Prospectus at www.ashland.edu/coburngallery .